As of late, it has occurred to me that I have been driving more than taking public transportation. That detracts from being able to see the world at eye level because driving in Chicago requires you to focus your attention in front of you always – except for when cars and daredevil children dash in front of you from behind parked cars. Fortunately in Chicago, the best way to combat missing out on ground activity is to take the bus. If you see something that catches your eye, pull the cord so the bus driver can let you get off at the next stop, exit the bus, and engage. I followed my own advice this past weekend. While strolling pass a few boutique cafés in Uptown, I espied the word “Crepe” in one of the windows. With limited French representation on Chicago Alphabet Soup, this finding was a boon. There were two window seat tables that awaited me. I obliged and entered an airy boutique, greeted and welcomed by a smiling face. Having gone to two other creperies in the city, I wondered how Crepe Town at 3915 N. Sheridan Road, my new find, would compare. A brief scan of the menu had quickly proven that I was going to be in for an eclectic treat, not just some crepes accented with a drizzle, dash, or splash of something. 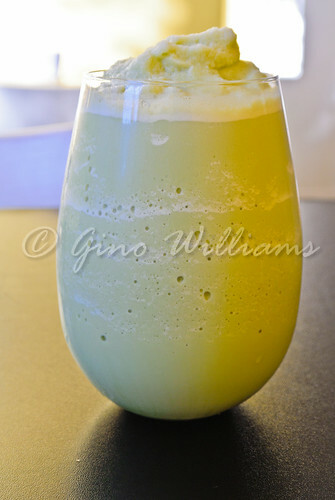 I knew that everything was going to be fine when the green tea bubble tea arrived and left me mouthing “Wow” after the first sip. The angels sang when I forked my first forkful of pasta a la tom yum into my mouth. I never would have fathomed the concept of Thai meets Italian with tom yum soup being the foundation for the dish. 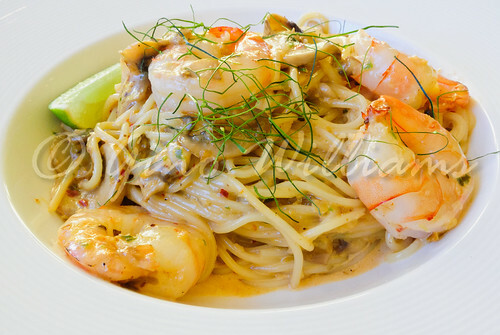 The pasta a la tom yum was flavoured with special chili herb sauce and then topped with mushrooms and shrimp. Just imagine me having a taste of that delicacy and now imagine me at the best Italian restaurant ever, making a scene that they can’t match the pasta a la tom yum I had at Crepe Town. I think the server was perhaps a bit concerned that I was slightly unbalanced because I know I did more than my share of mumbling and heaving heavy sighs throughout the meal. The angels continued to sing. By the time my order of Spice Up arrived at the table, the angels had taken off their robes and were doing jazz hands, kicks, and spins. We are talking about fried fish filet with coconut curry sauce and basil. The freshness and burst of taste of the fish were highlights alone. 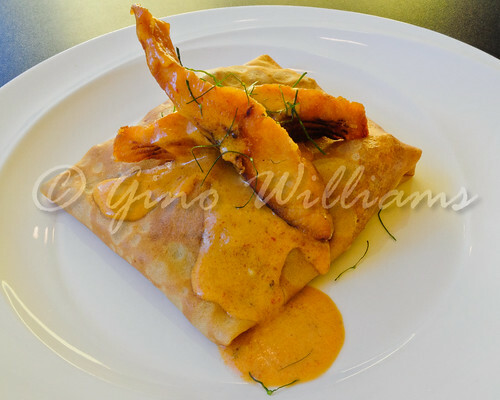 Add to that the fish being blanketed within a tasty crepe and accented with a curry sauce. This dish was so wrong for all the right reasons. Imagine me having a delightful bite of this crepe dish. Now imagine me at the best French bistro ever, shouting that they don’t know what they’re doing and they need to take lessons from the chef at Crepe Town. By the time I had eaten a fourth of the crepe, I had to apologize to the server for my constant ramblings. I’m not lying. I am sure you have seen alcoholics who babble at imaginary friends. You probably pitied them, too. You would have had the same sentiments while watching me shaking my head, smiling ridiculously, rolling my eyes, and prattling on to no one in particular about random nonsense. After finalizing the pasta and the crepe dishes, I requested a pause so that my feet come come back down to the ground. Really, I was hovering close to the ceiling. There was such a high from the bloom of flavourful dishes that I had just polished off. And while I was slowly returning to earth, I engaged the server in conversation about how long the restaurant had been in business. When she responded that they had been open for three years, it was indeed clear that I had been missing a lot by driving. All the times I had passed by Crepe Town and never looked off to the side and had I taken the Red Line to the Sheridan stop to browse the cafés and boutiques for a spell, I would have stumbled upon the meaning of bliss well before now. And after a little more conversation, I had made the observation that the dishes had a Thai influence to them. There are a few restaurants in Chicago that inject fusion into their menus, but Crepe Town is the example of perfection when it comes to blending two very disparate cultural cuisines. A little more banter and my feet were firmly planted on the floor. My belly was ready for some dessert. I ordered bananas foster and a cappuccino. I have to pay for the hole in their ceiling because my rocket blasted straight for the constellation Eating Gino before I completed the third bite. 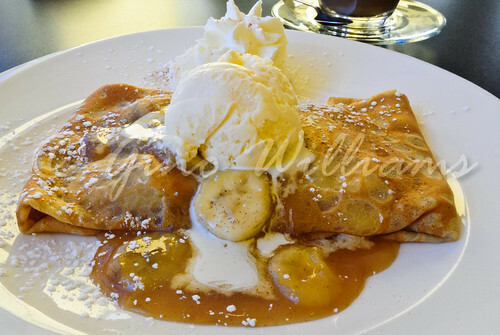 The delectable crepe encased bananas and caramel. Served with a dollop of vanilla ice cream and an accent of whipped cream, I operated in slow motion, working my knife and fork on the dessert while resuming my blarney. 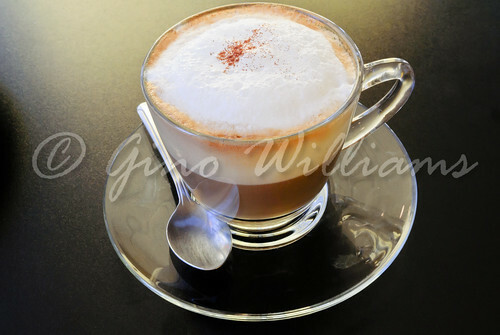 To make it worse, the cappuccino was from high quality beans. Not requiring any sweetener was the indicator. I covered my mouth to keep from shouting. I turned my face from the window so that pedestrians would not see my display of food satisfaction. And who should I face with a stifled smile plastered across her face but the server. “It’s ‘that’ good?” she asked. “Yes,” I responded, “can’t you tell?” There was laughter. 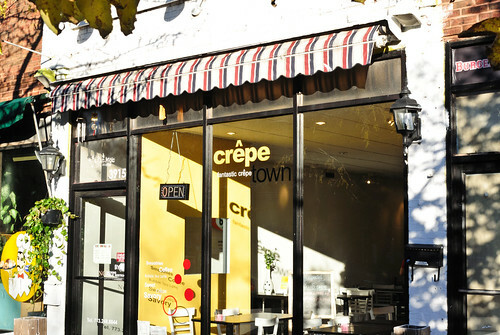 Crepe Town is a quiet café that I am sure fills to capacity earlier in the day on the weekends. It may also be a hot spot for the after-five crowd. I was fortunate to have gone when I had much of the café to myself. I could photograph my dishes without feeling as though I was disturbing anyone and I could enjoy my food without some laissez faire parent letting his or her Damien and Rhoda have a run of the place. If you want good crepes in the Chicago metropolitan area, there are a few creperies that I could recommend. I have blogged one crepe house – Icosium Kafe – that is still high on my list of recommendations and I have gone to another one that wasn’t worth blogging. Just to let you know how much I fell in love with the food, service, and the place, it is looking like Crepe Town may be a candidate for my Top 10 List of eateries for 2013. The angels would agree. An entertaining review and I enjoyed your culinary ride. 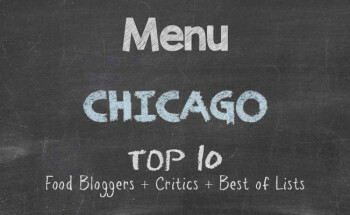 Sounds like it is worth checking this place out when in Chicago. oh, btw, you are sure doing some catch-up lately with the proliferation of blogs. You must be having a respite from work or something. It’s part catching up and part cleaning up. I had posted write-ups on pages instead of as posts, so I’m moving the pages to posts so that I can tag them for better search optimization. Now you’re seeing some of my writing and photos from early days in addition to my back log.